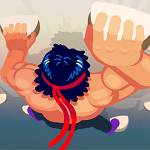 Help the protagonist in Rocky Climb to climb the very top of the mountain. To achieve this goal, it is necessary to cling to the stones and in no case to miss. After passing one mountain, new, more dangerous ones will be opened.